Women celebrate inside a "peace tent" erected as part of an event organised by "Women Wage Peace" group calling for an end to the Israeli-Palestinian conflict, near the Jordan River, in the occupied West Bank October 8, 2017. JORDAN RIVER, West Bank - Thousands of Israeli and Palestinian women trekked through a biblical desert landscape on Sunday, converging on the shores of the Jordan River in a march for peace. The women, many of them dressed in white, descended through the arid hills leading to the river, where they erected a “peace tent” named for Hagar and Sarah, scriptural mothers of Ishmael and Isaac, the half-brother patriarchs of Muslims and Jews. 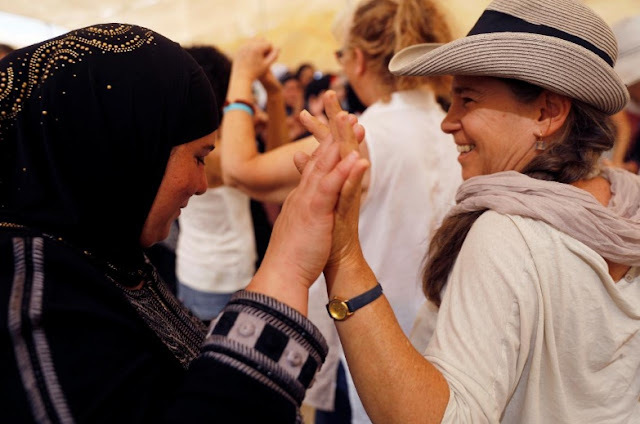 “We are women from the right, the left, Jews and Arabs, from the cities and the periphery and we have decided that we will stop the next war,” said Marilyn Smadja, one of the founders of the organising group, Women Wage Peace. The organisation was established after the 50-day Gaza war of 2014 when more than 2,100 Palestinians, mostly civilians, were killed. Israel put the number of its dead at 67 soldiers and six civilians. Some 5,000 women participated in Sunday’s march, organisers said. It began last month at several locations across Israel and will culminate in a rally later in the day outside the Jerusalem residence of Prime Minister Benjamin Netanyahu. Thousands of Israeli and Palestinian women trekked through a biblical desert landscape on Sunday, converging on the shores of the Jordan River in a march for peace.